Don't you love it when something fits you so well that it truly "fits like a glove?" 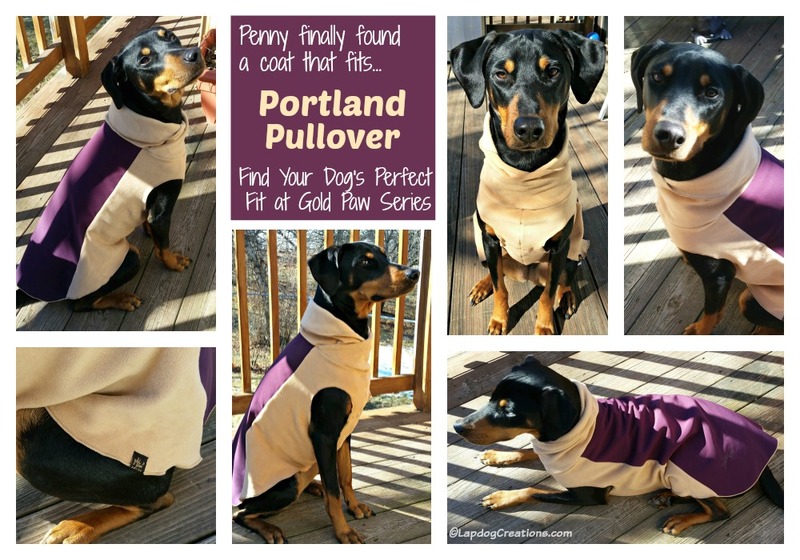 Thanks to Gold Paw Series fleece, now your dog can experience that "fits like a glove" feeling too! Disclosure: Gold Paw Series sent a Portland Pullover fleece, free of charge, for review purposes. We only share information that we feel is relevant to our readers, and all opinions expressed are our own. Gold Paw Series is responsible for the giveaway prize. This post contains affiliate links. If you click on one and make a purchase, we may receive a few pennies to assist in maintaining this blog. While some folks don't think their dog needs a coat, the reality is that for many dogs, a coat can be imperative to their health. Senior dogs, small dogs, dogs with compromised immune systems, and dogs that live in some of the harshest climates are all prime examples. Short-haired dogs who live in New England and love being outside in the cold and snow are also a great example. When we were asked to try a Gold Paw Series fleece pullover, I immediately said yes and knew that Penny would be the perfect candidate. Her long legs, petite frame, and deep chest have made it difficult to get a good fit from any off-the-rack coat - and we've tried many. I quickly learned that when Gold Paw Series says they are committed to the perfect fit, they aren't lying! They offer an extensive range of sizes that have been designed to fit every dog, from Chihuahua puppies to Great Danes! All Gold Paw Series fleeces are sized from 2 to 30 with corresponding length, girth and weight given for each size. Their handy fitting guide makes choosing the right size a breeze, but if you're still not quite sure which will be the best fit for your dog, just drop them an email or give them a call and you'll get the help you need. Penny received the Portland Pullover, size 24 in eggplant and we couldn't be happier. It fits... like a glove! I was amazed and Penny was super excited about having some new duds to wear (my little fashionista hasn't met a hat, headband, jersey or coat that she hasn't loved yet). The Portland Pullover is a hybrid style, combining the supreme comfort of the brand's Stretch Fleece with a waterproof shell for weather protection. The belly and neck are made from super stretchy Cirrus fleece, and the back is a water resistant, dirt repellant BionicECO Softshell. Like the name suggests, the Portland Pullover is incredibly easy to put on - simply slip it over your dog's head, then bring their front legs through the holes. That's it - no fidgeting or tugging, and no snaps, buckles or zippers to deal with. 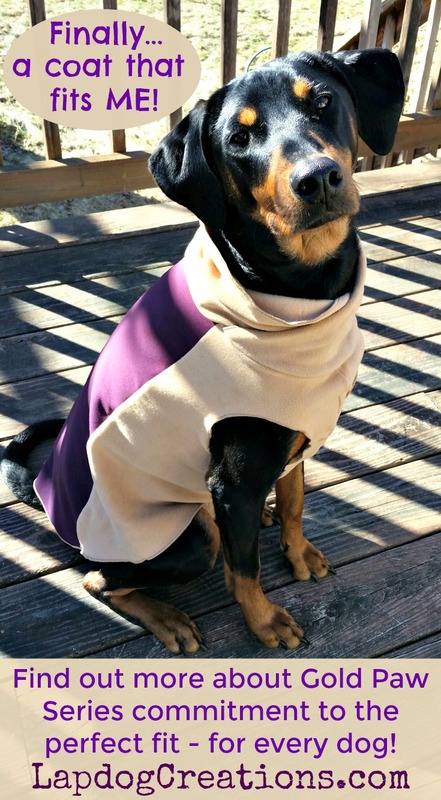 The fleece hugs your dog's body to create that perfect fit. I honestly can't believe how perfect it fits Penny! There are no snug areas, no areas fitting too loosely, and it's not longer than she is. It really, really fits! The fleece itself is amazing and so incredibly soft - like buttah! - that I'm a little jealous. I want a matching hoodie for myself (they do make a human wrap, but I'm more of a hoodie-wearing Dog Mom). And as if the perfect fit wasn't enough, the Gold Paw Series line is made in the USA! 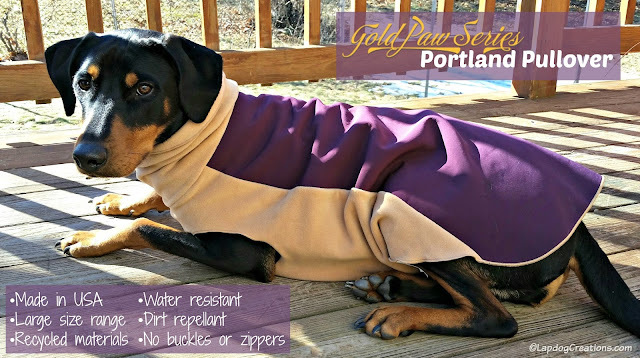 I am thoroughly impressed with the quality and fit of the Gold Paw Series Portland Pullover and am already thinking about what other items I want to get for my dogs (including replacing Teutul and Sophie's current coats). I also love that Gold Paw Series is a family-run company who proudly make all of their products in the USA. Their textiles are custom made for the brand, so you won't find them anywhere else. The signature butter-soft Cirrus Fleece comes from a bluesign certified mill and features 7% spandex for 4-way stretch. The company proudly proclaims that it hasn't met a dog it couldn't fit and we would certainly agree. Whether you have a dog who's smaller or larger than "normal," a mixed breed who doesn't fit the status quo, or you just want the softest, most amazing fleece for your pooch, look no further than Gold Paw Series! 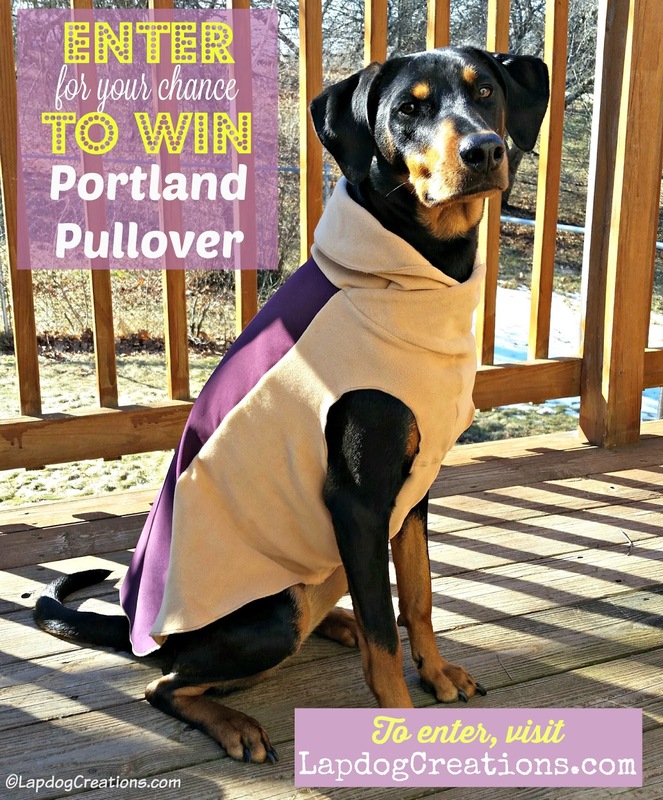 Thanks to the Gold Paw Series folks, one (1) lucky winner will get a Portland Pullover in their choice of size and color! Open to US residents, 18+. To enter, use the Rafflecopter widget below. Dexter can be hard to fit because his chest size is a little wider. He can range from an XS (which will look like a belly shirt) or even a Medium depending on the brand. Yes my dog can be hard to find coats and clothes in general to fit in to. She isn't that big but she has a bigger belly area so the clothes fit but then they don't close under her belly. My dogs are both hard to fit. Koira has a very bulky chest and neck, making her need to wear sizes that are too long, and she has a very nice tuck up, so a lot of coats are super baggy on her chest. Ptera is the opposite. She is super narrow. Our biggest problem fitting her is that the neck openings tend to be way too big, so she ends up getting a leg or two through them, and the coat slides off the back. Oh yes! We've ordered large sized sweaterscand jackets for the big boys and it turned out that large meant something that wouldn't even go over their heads. The little girls wound up with them. It's nice that someone is thinking about the big kids like Sebastian and Fudge. Theo is a unique size. Nelly has a different pullover fleece from Gold Paws and she seems very happy to wear it. It is easy to put on. It is hard for me to find a coat for my dog. One of them has a very big chess and the other one has a tiny one and the slim waist. My dog is long to fit because he is a chihuahua but it long and wide to fit! My dog is a mixed breed and he has a long body so he is hard to fit. I love that the collar keeps the neck warm and doesn't let the air in. It does look soft, snug and warm :) Ruby is a doxie/Chihuahua mix (we think). So she is short, compact, has a wide chest and not much of a neck. It is very hard to get a good fit for her when it comes to harnesses and jackets. Seems like a great product! sometimes, they are in between small and medium, if i get the small it is too short, if i get the medium it is too large around the belly and chest area. My dog is very long but is not very big around. She is only 11 lbs but ends up needing a size medium or large in most brands to cover up her back...for weight she should be a small. So, it is hard to find coats that fit well. I usually end up with ones with velcro adjustable straps with the straps dragging on the ground or making her custom sweaters. My mini doxie, Bowser, is always cold. It's difficult to find a good fit for him. I don't have trouble finding things that fit my big dog, but my chubby chihuahua is a different story. What a cute coat! It fits her like a glove. Definitely need to look into one for my girl Boomer. Thanks! My Tuc is a is a pitbull/black lab and he is not hard to fit. He wears a large size because he likes his treats and he has me trained very well. we do have a hard time finding a good fitting coat! and i don't even think she is a weird size! i think it's her fluff. I DO have trouble finding a coat for my Miniature Dachshund...obviously she is small, but long. Look Who's 2 - Happy Birthday Penny!